Are you one of those writers who sits down at the computer eager to get to work on chapter 4 or that rewrite of chapter 2? Many of us start out this way, excited to put our words down on paper, but over time we lose this joy. Often this is because we start to equate our words with money. We no long write for enjoyment; we write to sell our work. Writing, editing and teaching pay my bills. Unfortunately, when I focus too much on this aspect, the writing process itself becomes much less fun. How then should I go about rediscovering this joy? The obvious answer is to write something that I don’t intend to sell. This could be anything from morning pages ala Julia Cameron to some kind of exercise or fun project. Here are 4 suggestions. Dear Author. If I’m writing fiction, I can start my day creating a letter written by main character to me. What is important to my character in this scene or chapter? What do I need to know that I am missing? This starts me thinking about the story, but doesn’t put me under the pressure of “getting it right.” Although this letter isn’t something I’ll submit, it does teach me about my character and my story. Haiku or free verse? In the past, I’ve started my day by writing poetry. Sometimes I locate a poetic form or poetry writing challenge on Poetic Asides (http://www.writersdigest.com/editor-blogs/poetic-asides), the Writer’s Digest blog by editor Robert Brewer. Other times I pull a form out of In the Palm of Your Hand by Steve Kowit. At best, my poetry is pedestrian. At worst, it is dreadful, but that doesn’t matter if I’m just writing for fun. POV shift. I can also rewrite a scene from my manuscript using a different point of view character. If I’m working on a picture book, I rewrite the whole manuscript. Otherwise, I simply rewrite a scene. Sometimes I switch to the antagonist. Sometimes a secondary character. Sometimes I pick a character who didn’t even rate a name. When I’m doing this for fun, the quirkier the character’s take, the better. Marketless Musings. Think about that project you’ve been dying to work on but you are sure it won’t sell. Maybe it’s a dystopian novel or vampire love story – something editors no longer want. Maybe it is something that defies classification so the libraries and Amazon wouldn’t know how to categorize it. No worries. Write it anyway; write for the joy of placing your words down on the blank page. Writing for fun is definitely different than writing for pay. Although it may never find an audience, it can help you rediscover the joy in writing, joy that will flow over into your other work. Sue Bradford Edwards teaches our course, Writing Nonfiction for Children and Young Adults. The next section starts on January 5th. Great post. 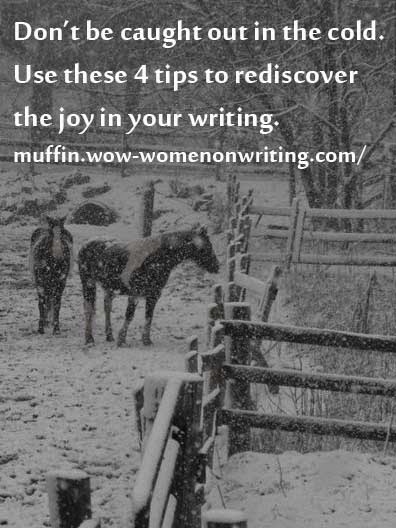 If we lose our joy, we'll definitely lose our way when it comes to our writing. @Sioux, I firmly believe you're going to sell that novel one day. Keep at it! @Sue, these are all such great ideas. I had sort of gotten into that rut of only writing for money this past year and am glad I decided to do NaNoWriMo because it helped me reclaim the joy in writing fiction. I'm going to try some of these ideas soon! I agree with Renee. You have come such a long way with your novel. You will finish it! I am doing ReviMo2015 for the same reason you did NaNo. Granted, I won't only be doing fiction, but I will be rewriting picture books. I love my picture book manuscripts but they consistently get put aside for paying gigs.